Did genes shape my mother tongue? Intuitively, one is inclined to answer with a resounding ‘no’. Of course not, had I been adopted by Thai parents, I would speak Thai. But I was not. My parents and my mother tongue are German. Still, there is a growing opinion that genes do nonetheless play a role. Before looking at this opinion, it is worth asking why genes shouldn’t play a role in language. A computational model by Andrea Baronchelli of Northeastern University presents a good case. It suggests that the great diversity of languages is due to fast language change. This in turn favours generalist language learners who are able to learn any language equally well. Why? Well, genes are slow to change. Language presents a moving target for evolutionary mechanisms. Instead of adapting to any language in particular, people who can learn any language are at an advantage. Her genes are different to mine, as is her language. Coincidence? It is thus crucial to look at the rate of language change: is it slow enough for genes to change in response to it? An examination of the connections between modern languages which emerged out of a common origin and separated millennia ago gives some clues as to the real rate of language change. For example, the first European visitors to India noticed curious commonalities between Indian languages such as Sanskrit (3 = ‘tráyas’) and European ones such as ancient Greek (‘treĩs’) and Latin (‘trēs’). Since the time of the split between European and Indian languages these words do not appear to have changed much. Nowadays, this can be extended beyond mere anecdotes. In a 2007 article in Nature, Mark Pagel and colleagues showed that the more often a word is used today the more likely it is to be similar across languages with a common origin, even if this connection lies 7,500 years in the past. Using structural features, such as grammar systems and the inventory of language sounds, one can look even up to 12,000 years into the past. These numbers correspond to approximately a quarter of the time the world’s languages had in order to differentiate! So, yes, language vocabulary and structural features do indeed change quickly, but still, there are exceptions, for example among the very common words. This opens up the possibility that genes – which are quite stable – do influence at least those language features which have been found to be consistent for thousands of years. What is missing so far is an actual example of such a gene-language link. It was found by Dan Dediu and Robert Ladd who looked at tone, a feature which is a relatively stable language characteristic. Tone refers to the use of pitch differences to differentiate words. Take this Thai tongue twister, for example: /mǎi mài mâi mái/. The same consonants and vowels get repeated with different pitches resulting in the sentence ‘Does new silk burn?’. Dediu and Ladd noticed a surprising parallel between the location of tone languages and the location of different versions of two genes in the world, as can be seen on the following map. They tested this gene-tone relation formally and it emerged that it is unusually strong among the possible combinations of genes and structural language features. Furthermore, it does not appear to be due to historical accidents or geographic patterns alone. These two genes called ASPM and Microcephalin are somehow linked to whether a language uses tone. How can that be? 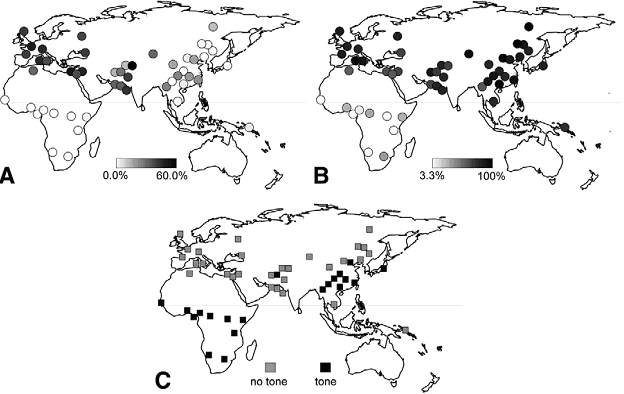 Geographic distribution of A) one version of ASPM, B) one version of Microcephalin, C) and tone languages. The most straight forward explanation would be that there is a tone gene – if you have it in one version you can learn tone otherwise not. Dediu and Ladd reject such a direct account – my own ASPM and Microcephalin versions do not determine whether I will ever be able to learn Thai. Instead, genes could exert a subtle effect, nudging successive generations of language learners in a certain direction. Imagine a bunch of German children were dropped on a lonely island and they learnt Thai from Thai native teachers. They would probably manage very well and their teachers would be very proud. Without their teachers noticing it, however, the German children struggled a bit with the Thai tone system. Over generations, this struggle would reduce tonality bit by bit. Were Thai teachers to discover this island again a few hundred years later, they would be astonished what an odd version of Thai people spoke on the island. A Thai without tone. So, because language is a not a homogenous ever-changing system, but instead a mix of stable and less stable features, the former could potentially be influenced by genes which are known to be stable as well. So, did genes shape my mother tongue? In a sense yes, the combined genetic background of generations of German speakers shaped German. In another sense no, my genes did not determine that German would end up being my mother tongue. Both answers are true. Auroux, S. (2000). History of the Language Sciences. Berlin, New York: Walter de Gruyter. Across language families, it is ranked the 15th most stable structural language feature among 68 investigated by Dediu and Levinson (2012). Across different ways of quantifying stability, it is ranked 19th out of 62 (Dediu & Cysouw, 2013).